Did you know they can completely change the look of their appearance through eating certain beauty foods and beverages? Most of know that fruits and veggies are great for our skin, but what you may not know is certain unconventional foods are also great beauty remedies. I’m always on a mission to keep my skin in tip top shape. For many years, I've been a firm believer that our skin reflects how healthy we are on the inside. By feeding our body what it needs, we can naturally give ourselves beautiful skin with less work topically. Read on for my 7 beautifying foods to add to your daily menu so you can literally put your best face forward. There is proof from numerous studies that 1-2 cups of coffee a day can be a powerful beauty food. How, you ask? Coffee is actually extremely high in antioxidants, the coffee bean is also very heat stable, so when you brew your cup of heart starter in the morning, all of the antioxidants stay intact, unlike many delicate antioxidants found in other plants and veggies. Coffee has also been linked to lower insulin to reduce type 2 diabetes. When your insulin is stable, so is your blood sugar, which prevents hormonal swings that can lead to breakouts. This makes coffee a double dose of goodness. Antioxidants in coffee protect the skin from sun damage and aging. These same antioxidants also prevent the breakdown of collagen in the skin. Just be sure to keep your coffee hit to a limit at 1-2 cups a day. Always drink 2 glasses of water for every cup of coffee you drink – you need to replenish the dehydration that happens in the body when you drink coffee. Yes, that’s right; not only can you have your coffee, but you can also keep your chocolate fix too. 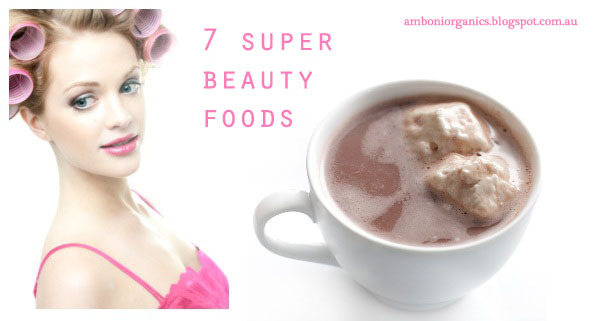 Cacao is a super beauty food. I’m not talking about the highly processed, low-grade hot chocolates that contain nothing but empty calories, I’m speaking of pure, raw cacao as it contains nutrition while giving you that satisfied feeling. The cacao bean is rich in magnesium, an energy mineral and vital electrolyte. This super-food is also a good source of sulphur which is associated with strong nails, shiny hair and a healthy liver and pancreas. 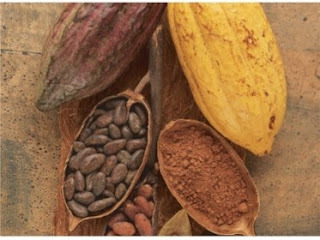 Cacao has also been found to help regulate blood pressure and reduce cholesterol while building the immune system. It is a rich source of antioxidants, fibre and heart- healthy polyphenols (a type of compound found in green tea and other plant foods). Polyphenols are not only good for your heart, arteries and blood flow, but also wonderful for giving you great skin. Lemons are my favourite beauty food. Lemons are a unique fruit that contain no fruit sugar, but high amounts of Vitamin C, and great detoxifying properties. Lemons detox the liver, kidneys and colon. When your insides are clean, so is your skin. Lemons are great for adding zing to salads, dressings, plain water and even smoothies. They brighten any dish they are added to. Lemons are a powerhouse of nutrition, so keep a few in your fruit bowl and you’ll see the results in no time. I especially love them added to herbal tea as well. Did you know this potent food actually makes you pretty? While it may not give you the best breath, it makes your skin glow, and keeps it from aging. 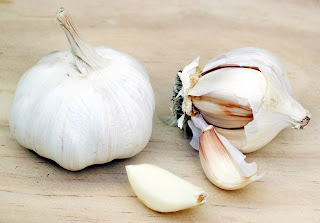 Garlic is not only rich in antioxidants, but also rich in the mineral selenium. Selenium is found in foods such as Brazil nuts, sunflower seeds, garlic and some animal sources of protein. Selenium is essential for keeping your skin in good condition, it keeps nails and hair healthy, and it's also great for your heart. Garlic’s antioxidant and selenium content, along with trace B vitamins, make it a must have for your beauty routine. Pumpkin keeps your skin glowing from tons of Vitamin A in the form of beta carotene, the seeds from pumpkin, which are also known as Pepitas, also keep you pretty but for different reasons. Pumpkin seeds are the only alkaline forming seed there is, meaning they actually promote your body to fight inflammation. They are also rich in zinc and protein which are crucial for good skin. First, zinc fights acne and dry skin and secondly, protein aids in collagen production of the skin. Plant proteins are much healthier for the skin than animal proteins are, since other compounds in animal proteins actually break down collagen in the skin. 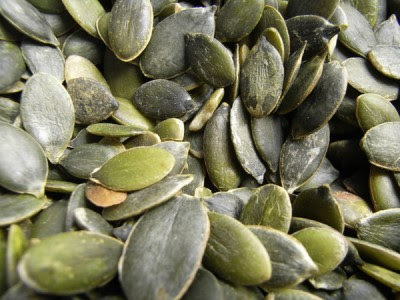 Pumpkin seeds are easy toad to your diet, sprinkle them into cereals, yogurts, salads or even smoothies. I like to add them to my homemade muesli bars. If you want great skin, get some flax oil into your diet ASAP. I know, it’s a source of fat, but not all fat is bad. This fat in particular is acne’s worst nightmare, along with wrinkles’ arch enemy. 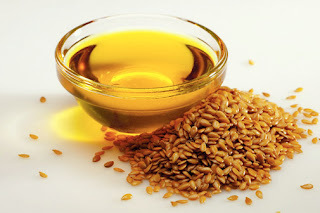 Flax oil is rich in Omega 3s and also detoxifying to the liver. It works in your body in a variety of ways to keep your skin soft, supple, glowing and best of all, clear. I like to use 1 tbsp. flax oil with lemon juice as a homemade salad dressing. It has a delicious nutty taste alone, and when paired with lemon, flax oil has a beautiful, zingy, sweet nutty flavour. Try it on your next salad to enhance your beauty routine. While there are many well-known beauty foods out there, these are some of my favourite, they are readily available and very effective ones. Do you eat any of these beauty foods? Tell me about it!